July 20 is the anniversary of the Moon landing. On July 20, 1969, America met the challenge and successfully landed two men on the Moon. 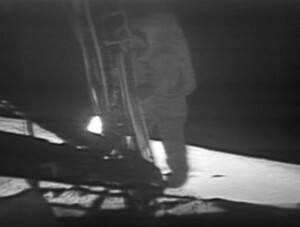 Astronauts Neil Armstrong and Edwin “Buzz” Aldrin left their Apollo lander module and took the first steps on the Moon. Armstrong described the surface dust as “fine, almost like a powder”. Aldrin described the view as “Magnificent desolation” Both men spent their time on the surface collecting samples and photographing every part of the landing module. These photographs would help NASA engineers improve the design of future landers after seeing the effects of the landing on their design. The astronauts reported little difficulty adapting their walk to the one sixth gravity they were used to, but the moondust was a little slippery. Armstrong said he had to plan his movement six or seven steps ahead of time. After two and a half hours, they returned to the lander to rest before departure the next day.